Last week I shared my creamy chicken soup – the absolute best way to make chicken soup! 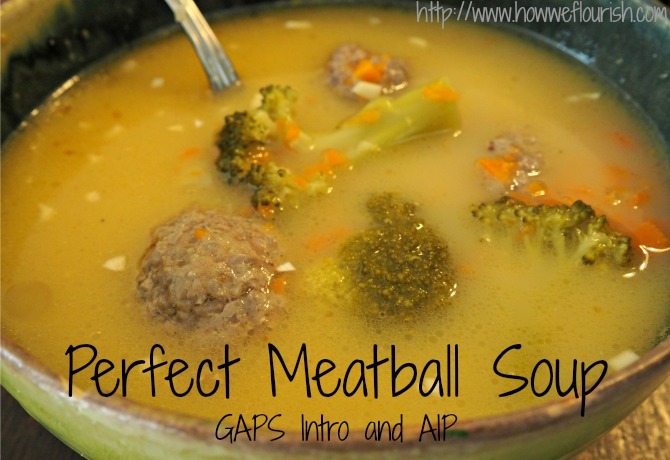 This week I’m sharing my other favorite soup: my Perfect Meatball Soup. For the past 3-4 weeks, I have been eating at least one serving of each of these every day. And, I swear, every batch I make tastes better and better. Now that I have perfected the recipes, I find these two soups to be incredibly satisfying and I don’t get sick of them. Having a chicken soup and a meatball soup to rotate between gives all the variety I need. No, really! When it comes to GAPS Intro, simplicity wins. By always having a chicken soup and a meatball soup that I find extremely satisfying available, I don’t have to meal plan. I simply make a new batch once I run out. I don’t think about it, and I always have choices for what I can eat. I get to pick my soup and any GAPS-legal add-ins I want: egg yolk, avocado, the animal fat of my choice, etc. For me, that is more than enough. And it’s delicious. The secret to this perfect meatball soup is giving the meat good flavor. With both GAPS Intro and the Autoimmune Protocol, there are not very many spice options. With GAPS Intro, one is further restricted by the requirement that meat be boiled during the first few phases. I found that salt and pureed onions really help the meat shine. Once I could add dried spices, I added Penzey’s Bavarian Seasoning (which is not AIP-friendly) and made them even better! This perfect Meatball Soup is gluten-free, grain-free, dairy-free, nut-free, nightshade-free, coconut-free, and egg-free. It is safe for those on any stage of GAPS Intro or Autoimmune Paleo. At the same time, it is delicious enough that anyone will love it, and it can be easily adapted to your tastes and dietary allowances. To be honest, what truly made this meatball soup perfect was adding butter. I added a stick of butter (8 tbsp) to the broth and veggies and cooked all of those together. Wow. This produced literally the best soup I have ever tasted. However, even without the butter, this soup is still pretty dang good. 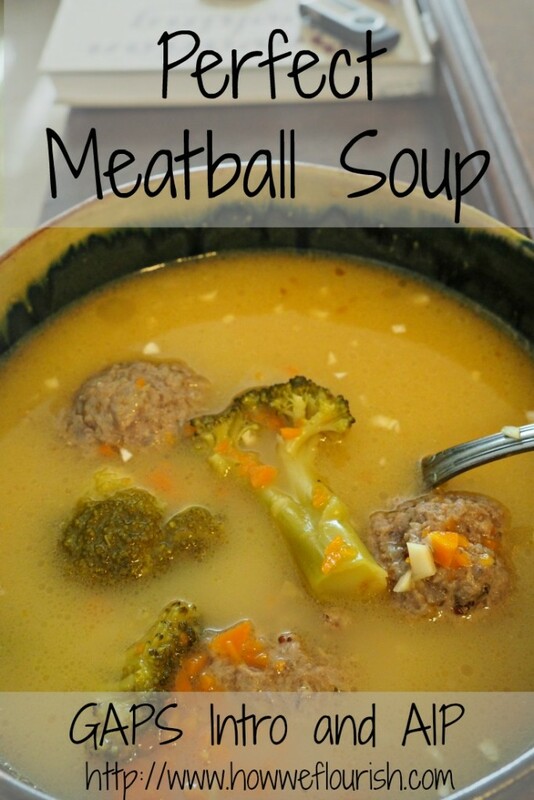 Don’t let your dairy-free lifestyle deter you from enjoying this amazing meatball soup! Place vegetables and broth in a medium sized pot. The broth should cover the vegetables; add more if necessary. Bring broth to a boil. Reduce to a simmer and cook for 20 minutes, or until vegetables are mostly soft. Chop the onion into quarters and run through the food processor until finely minced. Combine the ground beef, onion, salt, and spices (if using) in a bowl. Divide into 16 meatballs. When the 20 minutes are up, add meatballs to the soup. Return to a boil, then simmer for 10 minutes. Enjoy! This soup freezes well and will keep in the fridge for about a week. See serving suggestions to make it extra tasty. Serving Suggestions: Add a tablespoon of fat and a clove of garlic to each serving of soup. Bring to a boil and serve immediately. Salt to taste. If further along in your healing journey: If you tolerate egg, add a raw egg yolk to each bowl - it adds a delicious creaminess. Mashed avocado will add good variety. Shared on AIP Roundtable, Allergy Free Wednesday, GAPS Intro Recipes, and Wildcrafting Wednesday. Chloe – your meatball soup looks really delicious! We love meatballs and make them as often as possible. I have thought about using them in soups, but just haven’t done it yet. Great inspiration! I also love that it’s GAPS-friendly for those on a healing protocol. I was on GAPS for almost 2 years and I had great results. Thanks for sharing! Great to hear that GAPS worked well for you! It can be hard to find good recipes for it, but I absolutely love this soup. Meatballs are one of my favorite ways to eat me. If you try it let me know how it is! This sounds delicious. I haven’t had meatball soup in years, so yummy. Yep. 🙂 Soup is my favorite. I love soups with meatballs! Looks really good! The perfect comfort food anytime, & especially during the winter months! Thanks for sharing! Exactly! I love eating soup all winter long! This sounds really good and pretty easy to make. I love that the meatballs are cooked in the soup, so less dishes to clean! Exactly! The less dishes, the better, in my opinion! It really is super easy, which is so important with healing diets. I think it should be called vegetable soup with some meatballs! FIVE cups of veggies – YUM!?! Haha! Fair point! It never seems like that many vegetables until you count out how much it is. This looks great for these winter, snowy days! We love meatball soup! We had a Middle-Eastern version for dinner tonight! It would be great for that! I hope you enjoy it! You make GAPS look good girl! I am having soup much more often now during the winter and i’m beginning to run out of ideas. Thanks for sharing I’ll be making this real soon! Awesome! I’d love to hear how you like it. I love all these great ways to do GAPS Intro! I’m always looking for great soup recipes and I think you hit the nail on the head. Thanks! I’m always looking for new soup recipes to try. This looks really good!